Online print at home invitations give you expert results in no time at all. Print at home invitation maker from Smilebox is just part of the convenience we provide. Our free print at home invitation maker gives you copies that are crystal clear and with beautiful color. 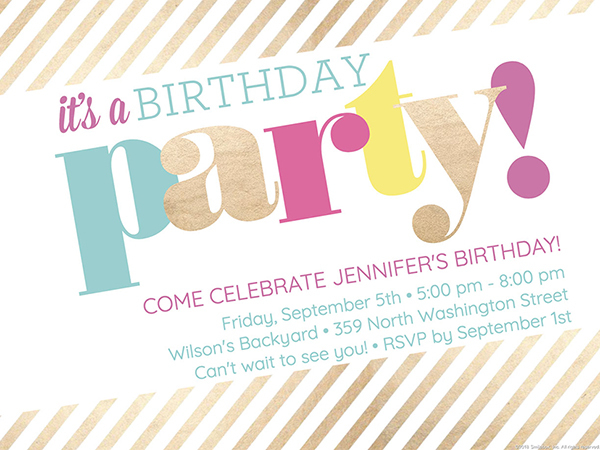 Start your party preparation off right with online print at home invitations that simply make sense. Online print at home invitations are easy to make but give you an end result that looks like it was made in a studio. Smilebox has developed its print at home invitation maker with quality in mind for every aspect of use. Printing your invitation is no exception. When you go through the final step of using the online print at home invitation maker, you receive a high resolution rendering of a type suited to expertly printed documents. The text, images, and colors of an online print at home invitation are of the highest caliber. All this is possible with no technical knowledge whatsoever - in just 4 easy steps! The selection of online print at home invitation templates from Smilebox covers numerous categories. In the free print at home invitation maker, find the invitation category you are looking for, and then the design that appeals to you. Click it and then click “Personalize”. Upload a photo using the free print at home invitation maker, which lets you access files on your computer, phone, and social media account by clicking “Add More Photos”. Don’t be afraid of using images with complex colors or shading – our print at home invitation maker can handle it. Change the colors, text, and font to suit your message and taste. Whenever you change any aspect of your print at home invitation, it is immediately shown on the screen. The final step of the free print at home invitation maker process gives you options for saving, posting to social media, and printing. When you choose the print at home option, creating a professional-looking invitation is just a matter of a few clicks. Online print at home invitations from Smilebox are available in a large range of categories. Within the free print at home invitation maker, you’ll find invitations for birthdays, holidays, weddings, parties, and everyday appreciation. Even within these selections, the watchword is choice. Every online print at home invitation design carries a different theme, from fun to formal. This is the starting point for inspiration when you use our free print at home invitation maker. And remember, all it takes is a few clicks and a bit of typing to change your print at home invitation maker template to a customized design that is ready for full color printing. Online print at home invitations are the ultimate in convenience for choice, personalization, and sharing. But when you print the actual invitation, you are making something that won’t get lost in the various images on your phone, computer, or social media account. Ensure that your memories last with our online print at home invitation maker and its quality printing capability. The same goes for your loved ones. When you send them a paper invitation created with our free print at home invitation maker, you’re giving them a gift that they can cherish for years. With so many designs available for every occasion, you can frequently use the print at home invitation maker and send each beautifully printed copy to those who care.